We continued to deliver the innovative, quality research that we’re known for: futures-focused, collaborative, and change-making in 2016. 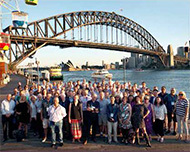 Throughout the year our researchers participated in over 100 research projects located around Australia and overseas, contributing $6m of research income to the University of Technology Sydney. We supported 38 postgraduate research students as they apply transdisciplinary thinking to the most urgent and exciting sustainability challenges of our time. Congratulations to Reza Memary and Eleanor Glenn who graduated in 2016 with PhD’s in sustainable futures. We started the year by championing the many benefits of energy efficiency by co-hosting the 2016 Australian Summer Study on Energy Productivity with the Australian Alliance to Save Energy. During the year we won funding for a number of innovative projects that delivered on our vision for a future where energy is clean, affordable and accessible to all. We also completed several largescale research projects that support better water, sanitation and hygiene (WASH) policy, advocacy and practice in developing countries this year. We continued to build strong partnerships in 2016. 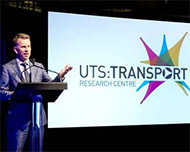 We are an integral part of the UTS Transport Research Centre, a multidisciplinary, cross-facility transport research hub launched by the NSW Minister for Transport, The Hon Andrew Constance MP on May 17, 2016. We also launched a public access Internet of Things (IoT) low-power, long-range, wide-area network (LPWAN) for Sydney in partnership with Meshed Pty Ltd, and The Things Network. We were pleased to broker the establishment of EnergyLab, Australia’s first energy accelerator that will to support entrepreneurs striving to commercialise renewable and advanced energy solutions. The insights we have gained from twenty years of using transdisciplinary research to create change and shift thinking towards sustainable futures made ISF researchers the ideal editors for Routledge’s new book on Transdisciplinary Research and Practice for Sustainability Outcomes published in 2016. Contributors to this book represent a who’s who of transdisciplinary expertise and experience globally, and it has been praised for both the breadth of practice and depths of theory it documents. We are now putting the finishing touches on our next three-year strategic plan, and preparing celebrations for our 20th anniversary. We’re passionate and committed to maximising the impact of our research by contributing knowledge in academia, policy debates and public discourse. Stay updated on our latest research findings, news and events by signing up to our newsletter or connecting with us on Twitter, LinkedIn and Facebook. In 2016, media interest in our research and sustainability leadership lead to 233 interviews and mentions in TV, radio, print and online news media. ISF’s commitment to contributing knowledge to public discussion also helped to shape Think: Sustainability — a new program from 2SER 107.3FM, aiming to translate UTS’s sustainability research into informative and entertaining programming. This program allowed ISF researchers to discuss topics such as sustainable housing, urine diversion, and light rail’s impact on animal species, in a format accessible to a wide range of audiences. Additionally, ISF researchers lead the public debate through their regular contributions to The Conversation, as well as through their appearances on programs such as ABC Morning News and Channel 10’s The Project. Nicky Ison appeared on Channel 10’s “The Project” to discuss the Homegrown Power Plan, and potential savings involved with switching to renewables. Dr. Michelle Zeibots called for better public transport as a viable solution. ISF researcher and PhD student Judith Friedlander appeared on ABC Morning News, discussing food waste and its relation to faith based practices. ISF Research Director Chris Dunstan appeared on ABC News to contribute to the public debate surrounding renewable energy infrastructure and the South Australian power grid. Media coverage of our research, with links to the full article where available, is listed on our ISF in the media web page. In 2016 ISF researchers authored a total of 140 publications. This included one book, 13 book chapters, 24 peer-reviewed journal articles, 25 conference papers and 46 research reports. To find ISF publications, browse by author or year & type of publication. 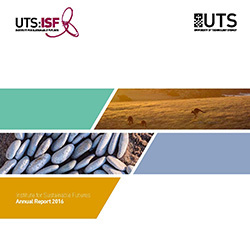 ISF publications, including reports, that can be made openly available are accessible from OPUS, the UTS institutional repository. The atmosphere at this year’s summer study was very positive, with a strong sense that the energy productivity revolution has really begun. More than two hundred leaders in energy productivity, energy efficiency and decentralised energy from government, politics, research, industry and NGOs attended the summer study. 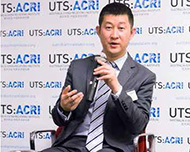 Climate and energy policy expert Dr Wang Tao gave some interesting insights into China’s transitioning energy policy and how the country plans to honour its pledge to source 20% of its energy from zero-emission sources by 2030 at an event hosted by ISF and the Australia-China Relations Institute (ACRI). 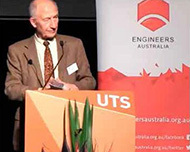 Ian Dunlop, a global leader in advising on the significant risks that climate change poses for our social, financial, and energy systems was the eminent speaker at this event co-hosted by ISF and Engineers Australia. A panel then discussed the opportunities to be achieved through an urgent re-framing of our economy. 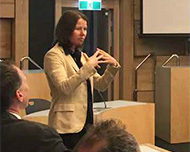 An outlook on the future demand for metals was presented by international expert Dr Barbara Reck during a talk about the global opportunity for a circular economy, which focuses on maximizing reuse and recycling while minimizing raw materials extraction. Dr Reck has been working with the Wealth from Waste research cluster. 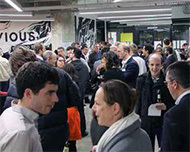 A capacity crowd came to hear from two Australian start-ups who are transforming Australia’s energy market and making money doing so. An expert panel then led a lively discussion about the best way to support clean energy entrepreneurs as they develop innovative products and business models in the rapidly changing electricity market. A new single point of contact for government, industry and community to engage with UTS’s multidisciplinary research teams; the transport research hub will focus on new technologies to optimise network performance across all transport modes. The Centre was launched by the NSW Minister for Transport, The Hon Andrew Constance MP on May 17, 2016. Read more about ISF's upcoming and past events. 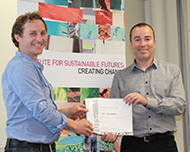 Dr Dana Cordell’s pioneering research identifying phosphorus scarcity, tracking its life cycle and developing global and regional scenarios for its sustainable production and consumption, has been recognised with an Advance Global Australian Award in the Food and Agriculture category. These awards honour Australians who have achieved remarkable feats in their sector while living overseas or on their return to Australia. As an outcome of her doctoral research at ISF and Sweden’s Linkoping University, Dana co-founded the Global Phosphorus Research Initiative and public website with colleagues in Sweden and Australia. Awards and commendations In 2010 she was employed by the Stockholm Environment Institute to work as a core member of a competitive international consortium of researchers on the Sustainable Use of Phosphorus project for the European Commission (D.G. Environment). As Research Director at ISF, Dr Cordell leads 90 partners in the collaborative P-FUTURES project across Australia, Vietnam, Malawi and the U.S which works with local stakeholders to identify how urban food systems can cope or transform in response to the emerging global phosphorus challenge. She also leads the Sydney’s Food Futures project which models current and future food production scenarios to support stakeholder dialogue and decision-making on resilient food futures for Sydney in the face of climate change and urban growth. Dana’s excellence in the field of sustainability research has been recognised with a host of prestigious accolades including the Eureka Prize for Environmental Research (2012) a Banksia Mercedes-Benz Environmental Research Award and a position in Australia’s 100 Women of Influence (2013). Penrith City Council was highly commended in the Climate Change Action category of the Local Government NSW Awards for its Cooling the City Strategy. This Strategy comprises over 50 actions for policy and planning, engagement, green infrastructure and water sensitive urban design. It is supported by ISF research to identify local hotspots in three suburbs within the Penrith LGA by mapping heat, vegetation and council assets. Council overlaid data on transport corridors, schools and aged care facilities to identify areas of higher vulnerability to heat, to understand the relationship between heat and vegetation coverage and to explore strategies associated with responding to heat. ISF offers an award-winning postgraduate program for Masters and Doctoral research students. Our postgraduate students work at the leading edge of complex societal problems and sustainability challenges, across diverse sustainability topics, to deliver real-world impact and contribute to stocks and flows of knowledge. In 2016 ISF supervised 38 students, 8 joined the prgram in 2016 and 2 graduated in 2016. 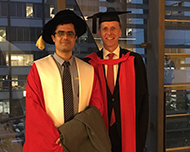 Reza Memary graduated from UTS with a PhD in Sustainable Futures in October 2016. His thesis Life Cycle Assessment for metals: from technical investigations to system innovations investigated how to improve industry tools used to quantify the environmental impacts of metal provision activities, in line with structural changes to socio-technical systems. 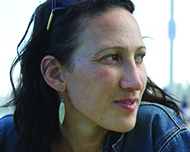 Eleanor Glenn graduated with a PhD in Sustainable Futures in May 2016. Her thesis From clashing to matching: examining the legitimation codes that underpin shifting views about climate change investigates people’s views about climate change. It examines how they shift in conversation, and the potential for climate change communications and engagement to engage with and shift views. ISF postgraduate student Ian Cunningham was awarded third place in the UTS Three Minute Thesis competition where students describe their research to a non-specialist audience in just three minutes with no props, no electronic media and only one static PowerPoint slide. Ian is researching the role of strength based approaches to development, in particular water supply. These are approaches that tip the balance from a focus on problems to a focus on possibility by shining a light on what people care about, what has worked in the past and how citizens can apply that to change. A video by ISF PhD student Tanja Rosenqvist about the need to rethink sanitation so that we focus on people (as well as poo) won the Student Big Ideas award at the 2016 WASH Futures Conference. Her research is exploring the relationship between the long-term sustainability of community-managed urban sanitation service provision in Indonesia and the way they are governed. 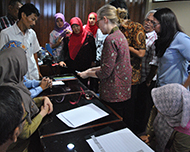 By taking the everyday experience of service users as her point of departure she is exploring how people living in three poor urban communities in the Indonesian city of Bogor have experienced the implementation and management of community-managed sanitation systems. Find out more about our postgraduate program including how to apply, our current postgrads and our graduates. Our vision is for a future where energy is clean, affordable and accessible to all. This vision is supported by research that shows how we could achieve 100% renewable energy for the nation, and more specifically on Kangaroo Island where the undersea cable supplying electricity from the mainland is due for replacement. Our free online Network Opportunity Maps show where investment in demand management and renewable energy could reduce the need to invest in poles and wires assets, supporting the uptake of local sustainable energy options, and reduce costs for all consumers. A virtual trial of Local Network Charges and Local Electricity Trading indicated there is potential for distributed generation to meet local consumption, which is unlikely to be realised under current market conditions. And the Global Wind Energy Outlook presents the potential of wind power to fulfil international energy needs, and the future of the wind energy industry out to 2050. Rapid changes within the energy market have demonstrated the need for long term decision making, to ensure energy infrastructure runs optimally. In producing theoretical scenarios for a transition to decarbonised energy systems, ISF’s research has demonstrated that moving to a 100% renewable energy system by 2050 is both technically possible and economically viable for Australia. This modelling demonstrates potential savings of $20billion a year, by first implementing renewable energy in the stationary power sector, and then utilising the savings created by this measure to implement renewables in the transport sector. Our vision for a clean energy future was further supported by research conducted at Kangaroo Island, where the undersea cable supplying electricity from the mainland is due for replacement. We were tasked with investigating whether options for reliable local power supply that utilised local renewables were reliable, viable and cost-effective, compared to simply replacing the cable connecting Kangaroo Island to the mainland. Our scenario demonstrates that local electricity production would be a timely and viable alternative to constructing a new cable, while also enhancing the energy selfreliance of Kangaroo Island, providing further economic and social opportunities for the local community. For a market in distributed energy or demand management to develop, it requires clear and accessible information about network costs and constraints, to allow the market to invest in reducing traditional network investments. Our free online Network Opportunity Maps show where investment in demand management and renewable energy could reduce the need to invest in traditional electricity infrastructure, such as poles and wires, by presenting network information in a concise and accessible manner. In summarising the potential of decentralised energy resources across the National Energy Market, the Maps support the uptake of local sustainable energy options, with the aim of reducing costs for consumers. Improving opportunities for smallscale distributed energy generators to distribute and sell energy could unlock substantial clean energy potential. Our virtual trials of Local Network Charges and Local Electricity Trading demonstrate the value of distributed energy generation by modelling the benefits of avoiding infrastructure duplication, optimising the sizing of distributed generation, and supporting incentives for dispatchable generation during peak periods. Our research shows that distributed local energy could meet local consumption needs, in a manner unlikely to be realised under current market conditions, while also providing flexibility in the production and use of electricity, and subsequent economic savings for consumers. Our vision for a clean energy future also crosses borders, as shown through the launch of the Global Wind Energy Outlook 2016. This report notes that the cost of wind power is now cheaper than nuclear or coal-fired power on an international basis, having fallen in cost by almost a third since 2009. Additionally, the Global Wind Energy Outlook also describes how increased global adoption of wind power, and more widely, renewable energy can lead to four other benefits globally — increased employment opportunities, reduced water use, reduced production of air pollution and reduced carbon emissions. 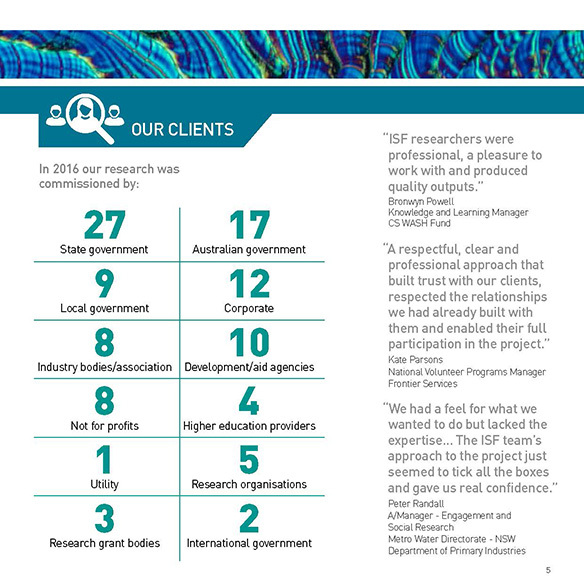 Find out more about our Energy Futures research program. The Institute for Sustainable Futures is a global leader in approaches to securing access to water, sanitation and hygiene (WASH) in developing country contexts, with multiple projects completed in 2016. The large-scale Enterprise in WASH research initiative completed its first phase after three years investigating the role of private and social enterprises in delivering WASH to the poor in Indonesia, Vietnam and Timor-Leste. Multiple workshops and sustained engagement with partner governments and civil society organisations is supporting uptake and use of the findings into policy and practice. Learning briefs for civil society organisations (CSOs) were produced as well as policy briefs, working papers and research reports, all of which are available from enterpriseinwash.info/. The learning briefs suggest approaches, strategies and program design for CSOs including how to reach the poor and disadvantaged. The second phase of the Enterprise in WASH project is now looking at three further dimensions of enterprise engagement, namely gender and entrepreneurship; business support mechanisms; and cost structures for private water enterprises in Indonesia, Vietnam and Cambodia. Researchers from ISF co-authored a framing paper for the United Nations High Level Panel on Water, exploring how to promote gender equality in both water resources management and WASH, and by doing so, contribute to more sustainable and effective water management outcomes for all people, while decreasing the inequalities prevalent in many societies. Prime Minister Malcolm Turnbull is a member of the High Level Panel on Water, and the Gender & SDG 6: The Critical Connection framing paper was part of the Australian Government’s contribution to the Action Plan of the Panel. The ISF WASH team presented seven papers, delivered five training sessions and presented three posters at the WASH Futures 2016 Conference in Brisbane from 16 to 20 May. The ISF poster on innovation in WASH and gender monitoring that explains how monitoring can achieve strategic gender outcomes and equitable services won an award at the conference and PhD student Tanja Rosenqvist won the Student Big Ideas Award for her suggestion that we need to move towards a people-centred definition of sanitation service. Find out more about our WASH research. Local food production in the Sydney Basin provides many benefits, and underpins the resilience and security of the city. However, competition for Sydney’s land for residential growth could threaten future local supplies of fresh food. By mapping Sydney’s current and future food production, ISF has created an evidence base to support effective policy and innovation for sustainable management of Sydney’s peri-urban agriculture. The benefits to growing fresh food in the Sydney basin are enormous. Growing perishable foods such as eggs and greens close to the market reduces food spoilage, food waste and fuel use, as well as providing employment opportunities and other economic benefits. However, the resilience of Sydney’s food bowl is currently under threat. A growing population, a pressured housing market, planning laws that favour development over agriculture, and a changing climate are resulting in mounting pressure for the Basin’s food producing lands to be converted to residential uses. 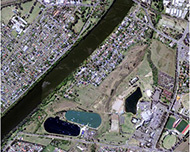 In a geographically constrained basin such as Sydney, periurban agriculture cannot continue to drift infinitely outwards, and may soon be lost if current rates of land-use change continue. This threatens the ability of Sydney to meet any of its own demand for food, and also could result in the loss of the many benefits peri-urban agriculture provides. In partnership with the Sydney Peri-Urban Network, ISF modelled and spatially mapped Sydney’s current and future food production for four future land-use scenarios. The modelling showed that if the proposed urban sprawl planned under the Plan for Growing Sydney is implemented, 92% of Sydney’s current fresh vegetable production could be lost by 2031. Adjusting for Sydney’s 1.6 million population growth—which will mean increased demand for food—the model finds that local agriculture will be able to meet only 6% of demand in 2031, compared to 20% currently. However, the modelling demonstrated that by preventing any further conversion of agricultural lands to residential uses, Sydney could retain some local food production, without exceeding desirable densities in existing urbanised areas. However, policy and planning changes are needed to protect these lands and prevent conversion to residential uses and fragmentation of agricultural lands. 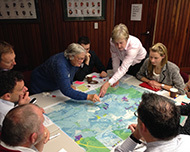 ISF also engaged with a broad range of stakeholders to explore the feasibility and desirability of food production scenarios and responses to these scenarios, utilising workshops, interactive maps, a website, a policy briefing with high-level government stakeholders, a public forum and a short animated film. In conjunction with Wollondilly Shire Council, the Sydney’s Food Futures project was the 2016 winner of the Natural Environment Policies, Planning and Decision Making award at the Local Government New South Wales Awards. ISF is conducting further research into the future of peri-urban agriculture in the Basin, including possible policy responses to help sustainably manage this valuable resource. This project also generated significant media interest through a front page feature article in the Sun Herald, as well as articles in outlets such as The Daily Telegraph and The Conversation. © Copyright UTS - CRICOS Provider No: 00099F - 13 July 2018 03:11 PM. The page is authorised by Deputy Vice-Chancellor and Vice-President (Corporate Services).